The future flagship of Numarine's explorer XP series will carry "the same DNA" as the 26XP and 32XP models, according to the builder. The new model will combine long range cruising, "stunning aesthetics" and "the capability to navigate the world's toughest waters." While details remain sparse, Numarine revealed that the full beam owner's suite will include a private terrace complete with a swimming pool and waterfall feature. 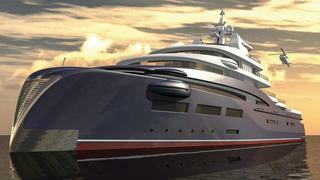 Elsewhere, a large tender will be stored on the foredeck while a plunge spa pool will sit on the upper deck. From ready-to-build projects to far-out concepts that may never hit the water, some of the most original yacht designers in the world have created some seriously impressive – and innovative – explorer yacht concepts. Click through to see our favourites... Baglietto's 43 metre explorer concept features a 58 square metre private owner's deck and a winter garden, which sits between the aft area and full beam saloon. A helipad sits above the stern garage, which is spacious enough for a 6.8 metre tender and several Jet Skis. 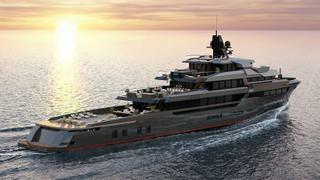 The yacht also has enough room for an additional 3.7 metre tender stored forward. The design by Santa Maria Magnolfi focuses on seaworthiness, comfort and safety. Interior materials will include Italian marble, exotic woods, Moroccan straw mats and Indian silk fabrics. 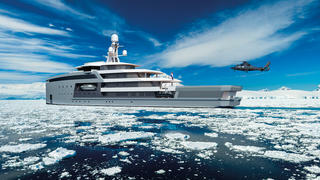 Baglietto's 43 metre explorer concept features a 58 square metre private owner's deck and a winter garden, which sits between the aft area and full beam saloon. A helipad sits above the stern garage, which is spacious enough for a 6.8 metre tender and several Jet Skis. 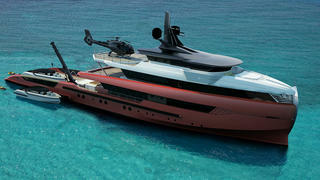 The yacht also has enough room for an additional 3.7 metre tender stored forward. 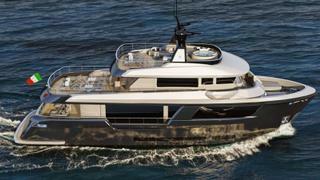 The design by Santa Maria Magnolfi focuses on seaworthiness, comfort and safety. Interior materials will include Italian marble, exotic woods, Moroccan straw mats and Indian silk fabrics. Viareggio Superyachts recently revealed new details about its 67 metre explorer yacht concept, which has been designed in collaboration with Hot Lab. The steel and aluminium 1,130GT yacht will feature a classic bow design and chunky superstructure, reminiscent of rugged working boats and research vessels. A small panoramic sundeck resembling a "crow's nest" sits at the top of the superstructure in a nod to "the legendary age of sail," the yard said. Other key features meanwhile include a full beam swimming platform, which can be folded out to be adjacent to the superyacht beach club, and a glass-sided infinity pool on the upper deck. 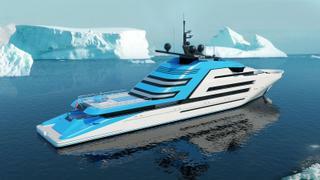 Inspired by the rough weather conditions of Norway and designed by Norwegian Kurt Strand, this huge 122 metre explorer yacht concept is not for the faint hearted. Six storeys high and with a 20 metre beam, the yacht transforms into an “open outdoor experience” with a number of tenders and toys. A large helicopter pad will sit on the aft deck behind a swimming pool with a retractable glass floor. The hangar will be large enough to accommodate two helicopters while the yacht’s aviation club will be equipped with bars and a launch area. Equipped to take on the most extreme conditions on earth, the Nemo 50 Ice draws on Ocea’s heritage of producing military ships. With a gross tonnage of 499, the yacht is equipped to carry tenders, rigid hulled inflatable boats and landing crafts, as well as specialised military davits to retrieve them. Another standout feature is the shafts, which have been integrated into dedicated structural skegs to protect them in the event of an iceberg collision. The 26 metre Ocean King 88 “creates superyacht impact from a small yacht,” according to Italian yard Cantieri Navali Chioggia. The four-decked yacht will be equipped with an engine room which will be accessible through the stern garage and can have multiple uses, including a dive centre, water toy and fishing storage or a small beach club. The upper deck will also feature a deck storage area for a six metre tender, water toys and a crane. Dutch shipyard Damen argues that its SeaXplorer 90 is much more than a concept. Fully engineered and part of a range that runs from 65 to 100 metres, the SeaXplorer 90 features a super-tough hull that is not just ice classed, it is Polar Code B compliant. Essential for any proper explorer, the yacht's deep stores mean that it can host several guests for 40 days at sea without the need for any provisioning trips. And when you decide on a spot of on-shore exploration the SeaXplorer 90's superyacht helicopter can make that wish possible. Dutch shipyard Damen argues that its SeaXplorer 90 is much more than a concept. Fully engineered and part of a range that runs from 65 to 100 metres, the SeaXplorer 90 features a super-tough hull that is not just ice classed, it is Polar Code B compliant. Essential for any proper explorer, the yacht's deep stores mean that it can host several guests for 40 days at sea without the need for any provisioning trips. And when you decide on a spot of on-shore exploration the SeaXplorer 90's superyacht helicopter can make that wish possible. 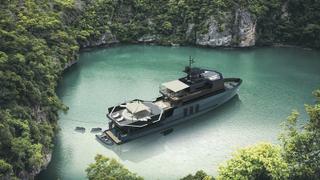 Argo is a rugged go-anywhere yacht concept that designer Ken Freivokh created for Italian yard Rossinavi. Measuring 48 metres LOA, this tri-deck yacht boasts plenty of storage space and is equally well suited to serve as a superyacht support vessel. Key features include a glass-sided observation deck which is accessed via an external spiral staircase. Designed by Marco Casali for the Italian yard Mondomarine, a brand of Palumbo Group, Tomahawk is a 52 metre explorer yacht concept that boasts a multi-functional aft deck. Once the tenders have been unloaded it can be converted into a basketball court or a swimming pool, while the davit crane is used to suspend a massive parasol when shade is needed. This concept is much more than just wishful thinking, as its semi-displacement hull has been developed in collaboration with research vessel specialist Insenaval — hence why Tomahawk has been described as "a yacht in a ship". Designed by Marco Casali for the Italian yard Mondomarine, a brand of Palumbo Group, Tomahawk is a 52 metre explorer yacht concept that boasts a multi-functional aft deck. Once the tenders have been unloaded it can be converted into a basketball court or a swimming pool, while the davit crane is used to suspend a massive parasol when shade is needed. This concept is much more than just wishful thinking, as its semi-displacement hull has been developed in collaboration with research vessel specialist Insenaval — hence why Tomahawk has been described as "a yacht in a ship". 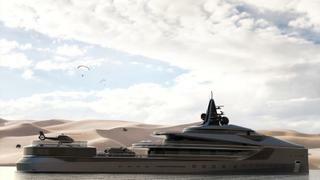 This 100 metre explorer yacht concept was created by Impossible Productions and Tim Dempers Studio. It looks unusual on the water, due to its protected courtyard spaces that sit on the top deck. These pods are designed to afford guests panoramic views in the comfort of a sheltered space. There’s space for a small blimp or a sea plane to land on the main deck and — despite the practical limitations this would impose — supercars could be kept in the saloon. This concept features climate control throughout the design — even the tenders and helicopters are housed in protected, air-conditioned environments to prevent corrosion. Perfect for people who want to see ice without feeling it. 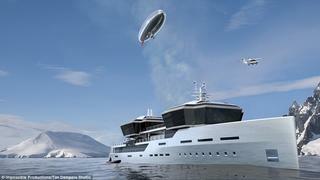 This 100 metre explorer yacht concept was created by Impossible Productions and Tim Dempers Studio. It looks unusual on the water, due to its protected courtyard spaces that sit on the top deck. These pods are designed to afford guests panoramic views in the comfort of a sheltered space. There’s space for a small blimp or a sea plane to land on the main deck and — despite the practical limitations this would impose — supercars could be kept in the saloon. This concept features climate control throughout the design — even the tenders and helicopters are housed in protected, air-conditioned environments to prevent corrosion. Perfect for people who want to see ice without feeling it. 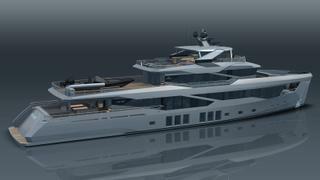 A new take on the explorer yachts by Motion Code Blue for Icon Yachts, the Sea Palace is 95 metres long. The Austrian design firm has managed to make the typical forward superstructure common on commercial vessels an elegant feature on this explorer packed with ideas — who doesn’t want a waterfall? This concept is based on an existing and fully engineered platform with a beam of 22 metres, enormous by most private yacht standards but the design seems to keep those dimensions in proportion. 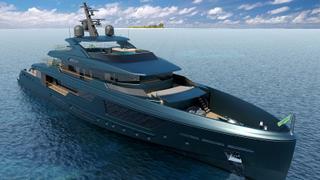 A new take on the explorer yachts by Motion Code Blue for Icon Yachts, the Sea Palace is 95 metres long. The Austrian design firm has managed to make the typical forward superstructure common on commercial vessels an elegant feature on this explorer packed with ideas — who doesn’t want a waterfall? This concept is based on an existing and fully engineered platform with a beam of 22 metres, enormous by most private yacht standards but the design seems to keep those dimensions in proportion. Not quite 100 metres, but close, this 99.06 metre explorer yacht concept by Sam Sorgiovanni Designs is perfect for people with big dreams. 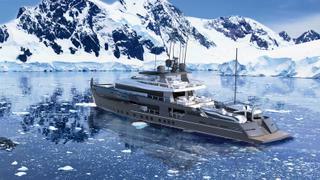 Traditional enough to fit neatly into the category of an explorer yacht, this concept also challenges the status quo. A reverse bow, not typical on this type of vessel, gives it an edge. A certified and retractable superyacht helipad conceals a two-story tender garage for a smaller displacement vessel and a fleet of speedboats. There is also plenty of room for relaxing on board – the owners’ deck has room for a nine metre swimming pool. Not quite 100 metres, but close, this 99.06 metre explorer yacht concept by Sam Sorgiovanni Designs is perfect for people with big dreams. 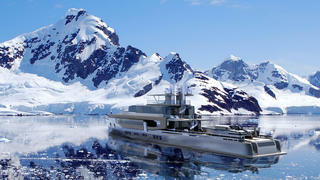 Traditional enough to fit neatly into the category of an explorer yacht, this concept also challenges the status quo. A reverse bow, not typical on this type of vessel, gives it an edge. A certified and retractable superyacht helipad conceals a two-story tender garage for a smaller displacement vessel and a fleet of speedboats. There is also plenty of room for relaxing on board – the owners’ deck has room for a nine metre swimming pool.